Adjustable stainless steel construction case sealer for humid or high- or low-temperature plant conditions. Seals up to 27 cases/min. 3M AccuGlide Stainless Steel Taping Heads included. 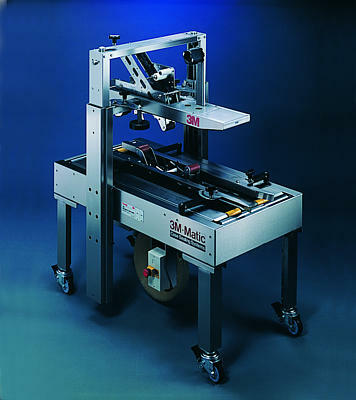 Choice of case sealers with manual feed and adjustment for a wide variety of case sizes. Sealing rate of up to 30 cases/minute. •Consistent durable case taper that manually adjusts to handle multiple box sizes. •Rugged construction with 16-gauge welded steel frame and powder coat paint finish. •Bottom belt drive for positive box conveying. •Food and beverage, paper and print, distribution centers, pharmaceutical and general industrial.